Melt the butter. Split the vanilla pod and scrape out the seeds. Use an electric whisk to beat the eggs and the sugar until you obtain a pale and fluffy mixture. Gradually whisk in the melted butter and then incorporate the sifted flour and the seeds from the vanilla pod. Once the cake mix is smooth, fill your muffin/cupcake molds. Allow to cool a little before removing from the molds then place on a wire rack to cool thoroughly. Soften the butter to room temperature and cut into cubes. Whisk the butter with the icing sugar to make a buttercream icing. Add the food colouring to obtain the desired colour - you could even make different coloured batches of icing. 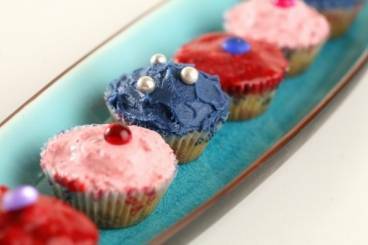 Use a spoon or spatula to spread the icing on to the cupcakes and decorate with hundred and thousands, candied fruits etc.